The encephalon is the rostral part of the central nervous system. It contains three major compartments, that from caudal to rostral are: rhombecephalon or hindbrain, mesencephalon or midbrain, and prosecenphalon or forebrain. Rhombencephalon and mesencephalon are known as brain stem. Rhombencephalon is found between the spinal cord and the mesencephalon. Anatomically, is divided intransversal segments known as rhombomeres (rh). Currently, eleven rhombomeres have been identified, being rh11 the most caudal and rh1 the most rostral. Rostral to rh1 is the isthmic region (also known as rh0). The part of the rhombencephalon that spans from rh11 to rh4 is usually known as medulla oblongata (or myelencephalon). The ventral part of rh3 to rh1, known as pons or pontine region, is larger than other ventral parts of the rhombrecephalon. 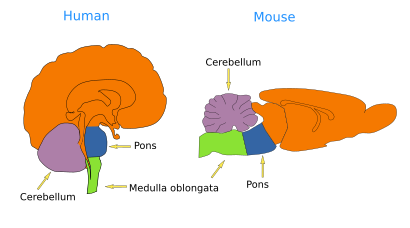 The cerebellum is an expansion of the dorsal part of rh1. rh3 to rh1, and the structures they contain, form the so-called metencephalon. The isthmic region or rhombencephalic isthmic is the limiting structure with the mesencephalon or midbrain. Main comparments of the rhombencephalon. Rhombencephalon is regarded as a primitive part of the encephalon because its organization is similar when phylogenetically distant species are compared, like amphibians and mammals. It could be said that the organization of the rhombencephalon was invented by the vertebrate ancestor long time ago, that it did work out, and that there were no major modifications through the evolution of vertebrates ever since. This conservative evolution may be related with the important roles of the rhombencephalon in vital functions for the animal survival such as breathing, blood pressure and heart beat rhythm. Different rhombencephalic compartments are involved in different functions. Medulla oblongata: breathing, food and water swallowing, muscle tone, digestion, heart beat rhythm. Pons: awareness level, motor control, ocular movement, sleep and awakeness. Cerebellum: fine tuned movements, body posture, body equilibrium, modulation of body movements. Rhombencephalon is also an important information relay or intermediary station between more rostral encephalon and the spinal cord or some muscles. Rhombencephalon contains many motor nuclei (groups of neurons that innervate muscles) that send axons that bundle as cranial nerves which leave the rhombencephalon to innervate different muscles and produce movement. That is why they are referred as motor nuclei. They are under the control of other encephalon regions which are not always located in the rhombencephalon. 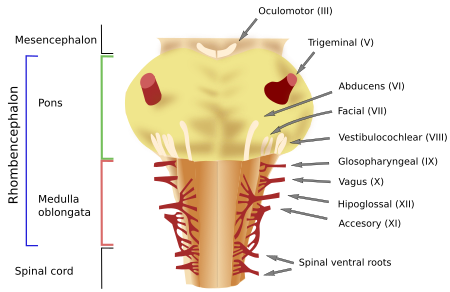 Cranial nerves may be composed of axons coming from one or from several motor nuclei. In some cranial nerves there are also axons coming from the body bringing sensory information to the central nervous system. Those cranial nerves with motor and sensory axons are referred as mixed nerves. There are 12 pairs of cranial nerves in vertebrates (12 at each side) numbered using roman numerals and ordered from rostral to caudal. In the rhombencephalon, there are the cranial nerves IV to XII, both included. Each of them innervate specific body structures. Cranial nerves of the rhombencephalon of a mouse. Ventral view. Modiphied from Cordes, 2001. IV, trochlear or pathetic nerve (motor): it is found in the isthmic region and innervates the extraocular superior oblique muscle. V, trigeminal nerve (mixed): in is found in the pontine region and brings sensory information from the head and face, and drive the cheuing muscles. VI, abducens nerve or external oculomotor nerve (motor): it is found between the pons and medulla oblongata, and innervates the extraocular lateral rectus muscle of the eye. VII, facial nerve (mixed): it is found in the rostral medulla oblongata. It brings information from gustatory receptors of the two thirds of the rostral tongue, and sensory somatic information from the posterior area of the internal auditory canal and from the outer ear. It innervates muscles involved in facial expressions and also those that control several glands like nasal, palatine, pharyngeal, salivary (sublingual and submaxillary), and lacrimal glands. VIII, vestibulocochlear nerve (sensory): it is found between the pons and medulla oblongata. It brings auditive information (sense of hearing) from the cochlea, as well as information coming from sensory structures of the membranous labyrinth of the internal ear (semicircular canals, saccule and utricule) to keep the body balance. IX, glosopharyngeal nerve (mixed): it is found in the middle part of the medulla oblongata. It carries sensory information from gustatory buttons of the posterior one third of the tongue, and also visceral information from other parts, including the pharynx. This nerve innervates glands, like parathyroid gland, and one muscle of the pharynx. X, vagus nerve (mixed): it is found in the caudal part of the medulla oblongata. It brings gustatory sensory information from epiglottis and visceral sensory information from thoracic and abdominal visceras. It innervates most of the laryngeal muscles and all the pharynx muscles, controls the voice muscles, and it is also in charge of smooth muscles of the thoracic and abdominal. XI, accessory nerver (motor): it is at the caudal part to the medulla oblongata. Actually, it is composed of several roots that join together at the caudal part of the rhombencephalon. As part of the nerve, there are also some ventral roots coming from the rostral level of the spinal cord. The rhombencephalic component of the nerve innervates larynx muscles, whereas the spinal cord component innervates muscles of the neck (sternocleidomastoid and trapezium). XII, hipoglossal nerve (motor): it is at the caudal part of the medulla oblongata and is actually made up of several roots. It innervates the intrinsic muscles of the tongue, which are involved in eating and talking. The cerebellum is a dorsal outgrowth of the first rhombomere (rh1). It has more or less parallel transversal grooves at the surface. There are two cerebellar hemispheres divided in lobules, which from rostral to caudal are named as anterior, posterior and flocculonodular. In transversal sections, it can be observed an internal part, known as white matter, with more abundance of neuropile (neuronal processes) than neuronal bodies. Superficial to the white matter, it is found the cerebellar cortex, with neurons arranged in a folded sheet. 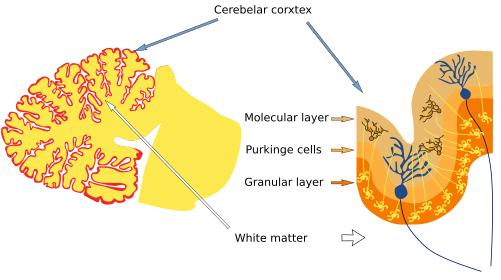 Granular cells and Purkinje cells are in the cerebellar cortex. In the deep part of the cerebellum, neurons are distributed through the deep cerebellar nuclei, which are the main output for the cerebellar information. The vestibular lateral nuclei is another way out for the cerebellar information. Cerebellum is involved in the fine coordination of movement, but also in the awareness. In humans, it also participates in language processing. The image on the left depicts the human cerebellum when cutting through the medial line. The white matter is shown, and the cerebellar cortex is in red. The image on the right shows the cerebellar cortex and its layers. Cordes SP. 2001. Molecular genetics of cranial nerve development in mouse. Nature Reviews in Neuroscience 2, 611-623.